Stockpiling high quality prepper gear can get really expensive. I have seen preppers who have bug out bags with a thousand dollars worth of gear packed in it. For most preppers this isn’t do able. Luckily there are some diy survival gear that most of us have around the house that can be used until we can purchase a better quality alternative. Another great thing about a lot of diy survival gear is that they can serve multiple purposes or functions. 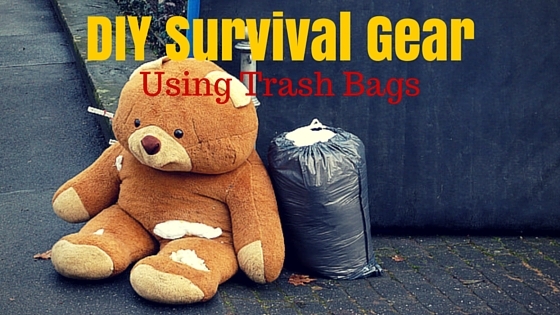 In this post I will be discussing diy survival gear using trash bags. Now I’m not talking about just any kind of trash bag but a heavy duty one. Preferably you will want to buy a contractor bag. They can usually be found at hardware shops like Lowes or Home Depot. This piece of diy survival gear can be used at home or added to your bug out gear. Either case, I would highly encourage you to add this. Let’s talk about the multiple ways that trash bags can be used. Rain poncho – Trash bags were designed to keep hard and liquid waste from leaking and vice versa. So these heavy duty trash bags can help keep you stay dry in a survival situation. You can simply cut open holes for your arms on the bottom sides and a circle at the top for your head. Tent/shelter – Used along with some duct tape, heavy duty trash bags can make a decent tent or simple shelter to keep you protected from the elements. You can make holes on the corners to drive wooden stakes into. Ground cover/tent footprint – Along with using a trash bag to make a tent/shelter it can also be used as a ground cover or tent footprint to give you some insulation from the ground or protect your tent from getting holes in the bottom. Dry shoes – You can place bags over your feet/shoes in rainy or snowy weather to keep your feet dry and warm. Bivy sack – Most trash bags won’t be able to fully cover a grown adult. However, if you place one bag on your bottom half and another on the top it can give you a little bit of warmth from the cold elements. Another option is to place one on the top half of your body while sitting over a small fire. This will allow the heat to get trapped inside. Mattress/pillow – To make yourself more comfortable during your survival situation you can fill your trash bag with leaves so that you can use it as a mattress and/or pillow. Water/dew catch – Fold the bag into a standing pouch and let it sit over night or in rainy weather to provide you with water to keep you hydrated. Water collection – If you are near a water source such as a lake, river or spring you can use the trash bag to collect some water to take back to be filtered and purified. Carry bag – If you don’t have bug out bag you can use the trash bag to carry your prepper gear. Blackout Shade – If you are in a bug in situation you can use black trash bags to cover your windows. This will make it appear to an outsider that your house is empty which can help prevent a home invasion. Trash bag – Last but not least you can actually use a trash bag to collect your trash or waste. If you are in a bug out situation you don’t want to leave any trace of your location or give someone the ability to track you. As you see a trash bag can be a great piece of diy survival gear. If you have any other suggestions of how trash bags can be used then leave a comment below.